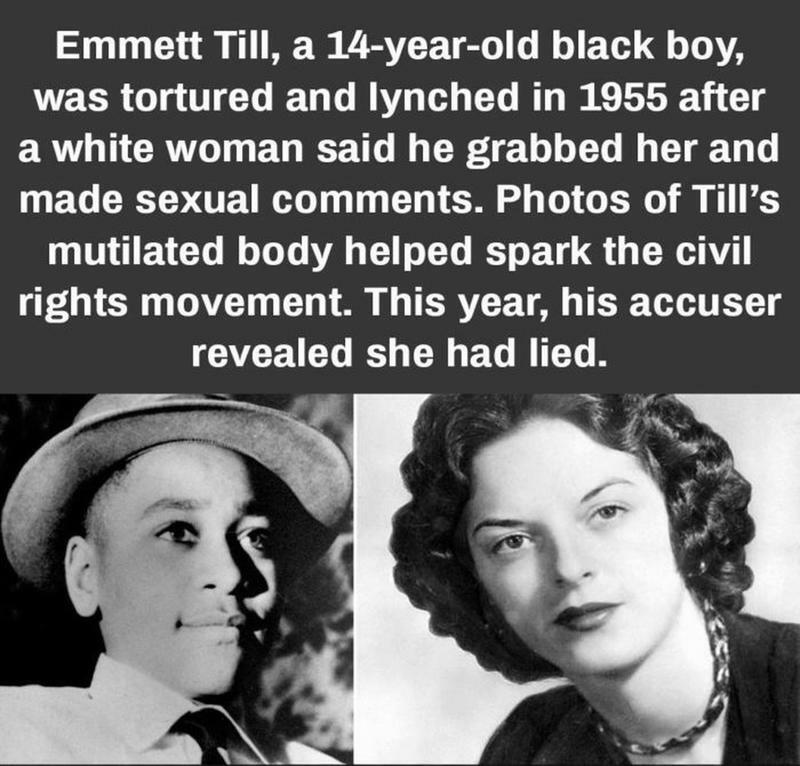 While visiting family in Money, Mississippi on August 24, 1955, 14-year-old Emmett Till, an African American from Chicago, is brutally murdered for allegedly flirting with a white woman four days prior. His assailants –the white woman’s husband and her brother– made him carry a 75-pound cotton-gin fan to the bank of a river and ordered him to take off his clothes. The two men then beat him, gouged out his eye, shot him in the head, and then threw his body, tied to the cotton-gin fan with barbed wire, into the river. Emmett grew up on the south side of Chicago, and though he had attended a segregated elementary school, he was not prepared for the level of segregation in Mississippi. His mother warned him to take care, but the teenager enjoyed pulling pranks. On August 24, while standing with his cousins and friends outside a grocery store in Money, Emmett bragged that his girlfriend back home was white. Emmett’s companions, disbelieving him, dared him to ask the store cashier, a white woman, for a date. He went in, bought some candy, and on the way out was heard saying, “Bye, baby” to the cashier. Carolyn Bryant, the cashier, claimed that he grabbed her, made lewd advances, and then wolf-whistled. There were no witnesses in the store. A few days later, Roy Bryant, the proprietor of the store and Carolyn's husband, returned from a business trip and learned how Emmett had made advances to his wife. Enraged, he went to the home of Till’s great uncle, Mose Wright, with his brother-in-law J.W. Milam in the early morning hours of August 28. The duo demanded to see the Emmett. Despite pleas from Wright, they forced the boy into their car and drove him down to the Tallahatchie River. Three days later, Emmett's corpse was recovered. It was so disfigured that Mose Wright could only identify it by an initialed ring. Authorities wanted to bury the body quickly, but Emmett's mother, Mamie Bradley, requested it be sent back to Chicago. After seeing the mutilated remains, she decided to have an open-casket funeral so the world could see what racist murderers had done to her son. Jet, an African American weekly magazine, published a photo of the boy's corpse, and soon the mainstream media picked up the story. Milam and Bryant went on trial in a segregated courthouse in Sumner, Mississippi. A few witnesses positively identified the defendants as Emmett’s killers. On September 23, the all-white jury, after less than an hour of deliberation, issued a verdict of “not guilty.” They explained that they believed the state had failed to prove the identity of the body. Many people around the country were outraged by the decision and also by the state’s decision not to indict Milam and Bryant on the separate charge of kidnapping. The Emmett Till murder trial brought to light the brutality of Jim Crow segregation in the South and was an early impetus of the African American civil rights movement. For 60 years, she has been the silent woman linked to one of the most notorious crimes in the nation’s history, the lynching of Emmett Till. But all these years later, a historian says that Carolyn has broken her silence, and acknowledged that the most incendiary parts of the story she and others told about Emmett were false. In it, he wrote that she said of her long-ago allegations that Emmett grabbed her and was menacing and sexually crude toward her, “that part is not true. As a matter of narrow justice, it makes little difference; true or not, her claims did not justify any serious penalty, much less death. The two white men who were accused of murdering Emmett in 1955 — and later admitted it in a Look Magazine interview — were acquitted that year by an all-white, all-male jury, and so could not be retried. They and others suspected of involvement in the killing died long ago.